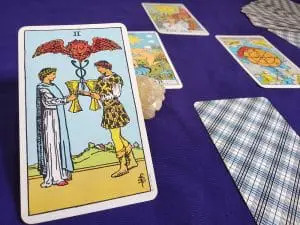 14 cards make up the Suit of Cups; Ace through 10 and the court cards: Page, Knight, Queen, and King. Cups make up 14 of the 56 Minor Arcana Tarot cards. 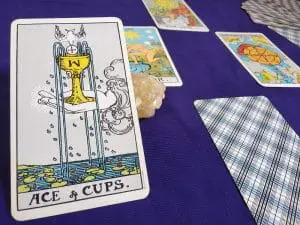 Symbolically represented on the cards as a chalice, the Cups are either being filled, overflowing, spilling, empty, or full, depending on the card. 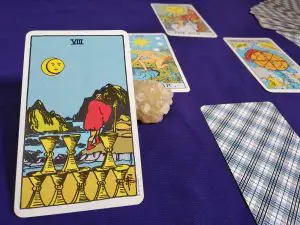 If there is water on the cards, it is a representation of the emotions and emotional depths within us. 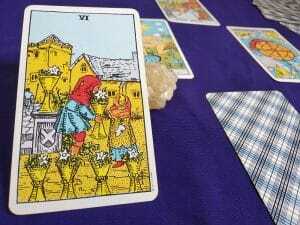 Each card has its own special scene which clarifies its meaning. The Cups are a symbol of water. Therefore, we will be focusing on emotions, purity, spirit, love, feelings, power, religion, and relationships. If Cups are involved, it can mean anything from a simple attitude adjustment to life-changing events like marriage and pregnancy. 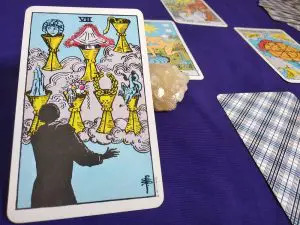 When combined with other cards of the Tarot deck, the Suit of Cups can either be a minor part of the reading or a pivotal point in a spread. Cups are ruled by the element of water. Water is yin in nature. A feminine energy, water is powered by the Moon. It cleans and purifies the human psyche. 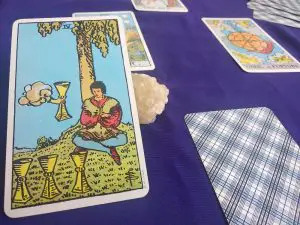 Also, Cups explore the deeper emotional involvements that we carry with us in this life, such as sexual relationships, deep emotional connections, and the “forever” kind of love. Strong emotions can be negative as well as positive. 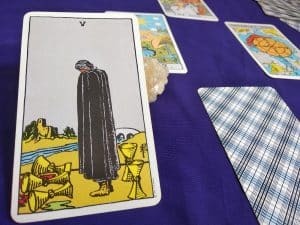 So, healing through meditation, art, and therapy is highly recommended when dealing with the Cup cards. Grief and emotional disruption are very bad for our health. Thus, it is important to realize that self-care and mental clarity are necessary. When a Cup appears, it is a reminder of emotional health in a particular area. Examples of this are relationships with co-workers, friends, love partners, and family. 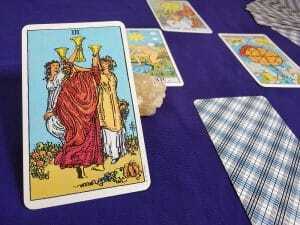 We can call on the Suit of Cups to guide us.